Life is short. I am 54 years old and I have learned one very important thing about the life we live. I have learned that many people don’t have the privilege in life that others have. What that means is that a lot of people may not have been given the same start in life as some others may have been given. Or maybe a turn of events in their lives that have taken them to an ultimate low. I have found that many people need help, guidance, and a chance at a better life. We own a company that does house cleanouts. We get many good items from these jobs. We said that if we grow as a company we would give back. We could make a lot of money selling the majority of these items, but we made the promise to give items to people that are in need. The first time I met a family to give items to was one of the most impactful moments of my life, I would like to share it with you. The family pulled up in an old pickup truck pulling an old flat trailer. As we loaded the truck and trailer with items that they needed badly they seemed very cautious. As I asked what was the most important things they needed they replied by saying that anything will help. I ask what about beds? Do you have enough beds for you and the kids? They replied by saying, we have not slept in a bed in over a year. As my expression froze I was taken back and everything in my life took a difference prospective. As they were ready to leave the father asked what he owed? I told him he did not owe anything. He shed a tear and said may #God bless you and thanked me. As he drove away and waved his eyes still damp from the tears, I realized I would never be the same. Why am I telling this story? 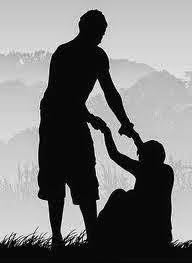 Because I believe that one of the most important things in life is to help others. The importance of helping someone change the path they have traveled for a long time is monumental. Many people want to change the way they have been living their lives. But because they have no guidance on how to do it, they continue to do the same things everyday and get the same results everyday. Give back to those who have never felt the feeling of accomplishing things. We can give them hope. Not many people are willing to help others. If you found yourself in a very tough situation, wouldn't you want someone to reach out to you and give you a chance at a better life? My Father-n-Law whom we lost to cancer, always taught me the importance of family, dignity, giving, honesty, and opening you heart to others. I will always try to live up to that philosophy. If you have the #opportunity to help someone, reach deep and do it. I promise you will find a place in you heart that will come alive. There is no amount of money that can give you that feeling. Set your own #goal to make a difference in some ones life. Reach out and pull someone up. I took this picture while in Colorado Skiing. I would not have been there if it weren't for the life choices I made. It was not easy, simple or uncomplicated. I remembered thinking about a close friend who let #life pass him by without doing what he really wanted to do. Now, he gets down on himself every time the thought passes. Is it to late for him? NO! Will he do anything about it?, Probably not. To many times I see people fall short of their chance to #succeed. Just one time make a #goal and never give up! Your life will surely change because of it! You are your own support team. 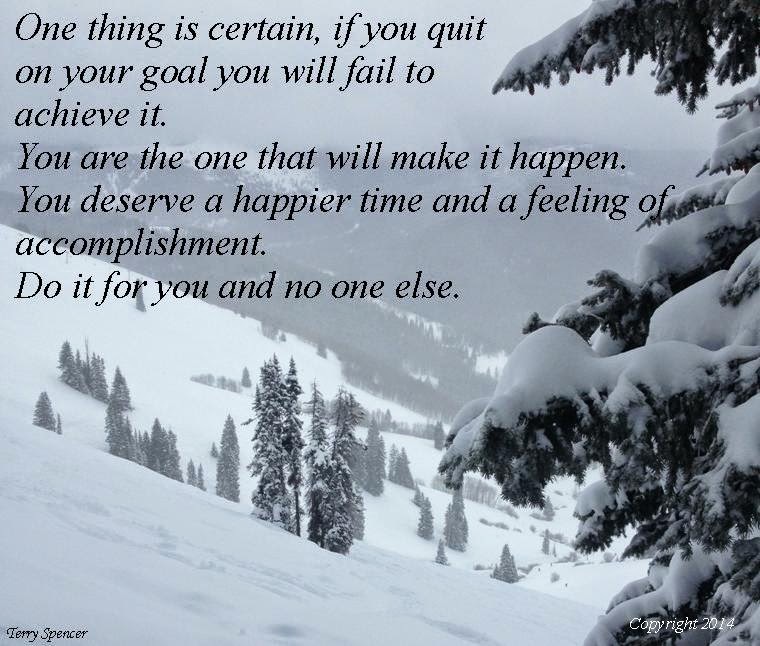 You are the one that will make it happen. Stop underestimating what you can do. You need to be happy with yourself to be able to bring all the happiness you can to others. Remember this, "negative words from other people mean nothing to you and will not make you quit". Be #strong and #passionate until your goal is reached. Don't forget, It's about YOUR health! You have one body, don't neglect it. Make a change today in your lifestyle that will benefit your health for the rest of you life. Forget about the past. Make it Happen NOW! If you need help let us know! Not successful in getting fit? 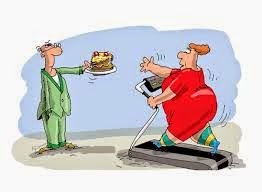 I have talked to countless people who tell me they have tried many exercise programs only to find that they do not work. After questioning there experience with some of these programs, the conclusion if usually the same. A large percentage of people ignore the fact that diet is a major part of a programs success. The body screams for more nutrition as it tries to feed the muscles the nutrients that they need after a workout. If you put junk into you system, you are not only depriving the muscles of nutrients. Many of the people that I have spoken to claim that the workouts make them hungrier than normal so they eat more. The problem is they are eating more junk food. The muscles don’t get what they need and you defeat the whole purpose of working out. If you are going to make time for the program and follow through with the workout, why not compliment it with a good diet. Eat correctly with some discipline and you will be surprised with your results. Don’t cheat yourself by cheating on your diet. Your results depend on it! Studies show that with proper nutrition during the first hour following a workout you can increase your body's ability to recover by more than 100%. The key component to maximizing this "window of opportunity" is a formulation of approximately 4 parts carbohydrates to 1 part protein. P90X Results and Recovery Formula is a state-of-the-art, great tasting, body-shaping cocktail that's guaranteed to take your results to the next level. Get the high-quality vitamins, minerals, and antioxidants your body needs to stay healthy while reaching your fitness and weight loss goals.‡ Select either Metabolism or Body Toning Formula. 30 Day Supply (Choose metabolism or body toning in next step) Enjoy a healthy “ActiVit” lifestyle! Taking a high-quality multivitamin like ActiVit® every day is simply the best way to ensure your body gets the nutrients it needs to excel and get the most out of your fitness routine. Formulated with safe and natural herbal ingredients, ActiVit will help you feel great on the inside and look great on the outside! ActiVit Multivitamin Formula We designed the ActiVit Metabolism Formula to be a 100%-natural, safe, and effective multivitamin, packed with 20 essential nutrients—and then we added extra ingredients to enhance your results from regular fitness training. This unique formulation was designed to give you maximum energy for an active lifestyle, but ActiVit Metabolism Formula is great to take even if you aren’t exercising as much as you’d like. The key is to take ActiVit every day. Aside from the daily essential vitamins you need, we chose the ingredients because they have been shown to positively affect your metabolism and energy levels while burning off fat. * Click here for Metabolism Formula ingredients and nutrition information. Click here for Body Toning Formula ingredients and nutrition information. Warning: This product should be used as a dietary supplement only. Those with medical concerns should consult their physician prior to using this or any other dietary supplement. As with any supplement, herb, or medication, do not use any Beachbody supplement, food product, or meal replacement product while pregnant or provide to a child without consulting a physician. Use products only after consulting your physician about your specific health needs. Keep out of reach of children. ‡This product is only available to residents of the United States and its territories. WARNING: Consult with a healthcare professional if pregnant, breast feeding, providing to a child, or if you have any other unique or special needs. Keep out of reach of children. **With Home Direct, you’ll receive this item every 30 days, shipped directly to your door and billed to the credit card used today. You may cancel at any time.